This bundle will take your camera skills to the next level. There are a lot of things that it takes to make a good photographer or videographer, especially nowadays when there are so many different kinds of equipment. See our buying guides on the best cameras for creatives and the best tripods for more info on getting the right kit. But you'll also need the right skills. 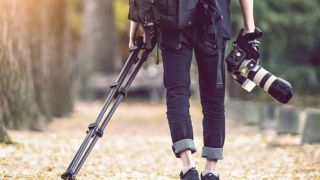 Luckily, the Beginner-To-Expert Photography & Videography Bundle will teach you everything you need to know in this area, making you a master photographer or videographer who can handle all kinds of equipment. With this bundle, you'll learn how to shoot expert-looking video using a DSLR, you'll learn how to properly operate a drone camera, and you'll learn how to produce a video from beginning to end. With The Beginner-To-Expert Photography & Videography Bundle, you'll be able to snap photos of stunning landscapes, shoot videos of exciting events, and edit them so professionally they'll belong in a magazine or on TV. Get this set of courses now for only $35.